This is something I’ve been thinking about for a while. I have a pretty long Reading List and Spotlight often fails to find things in it. For that reason I came up with this little script which you might find useful. 1. 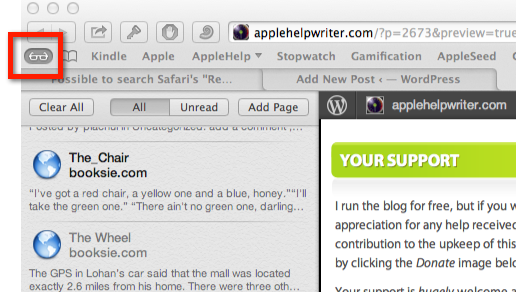 Open up Automator by typing auto in Spotlight. 2. Click on ‘Service’ (the big cog wheel) and then ‘Choose’. 3. Change the Service receives option to “No input” from the dropdown menu. 4. In the small filter bar to the left, type ‘run app’. You should see an action called ‘Run AppleScript’ in the second column. Drag it to the big pane on the right. 5. Select all the purple text inside the window and delete it. You don’t need any of it. 6. 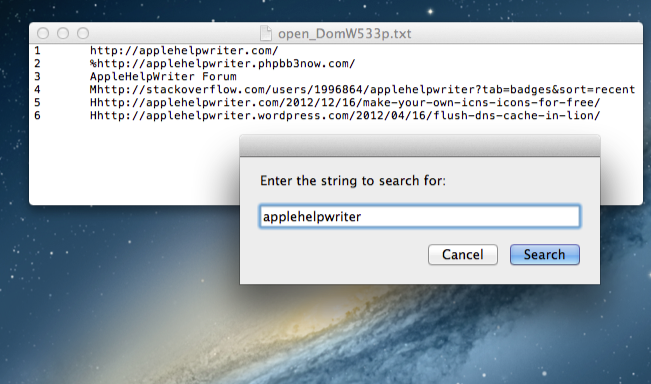 Command click on the image below, and copy the code from the pastebin page that opens up in another Safari tab. 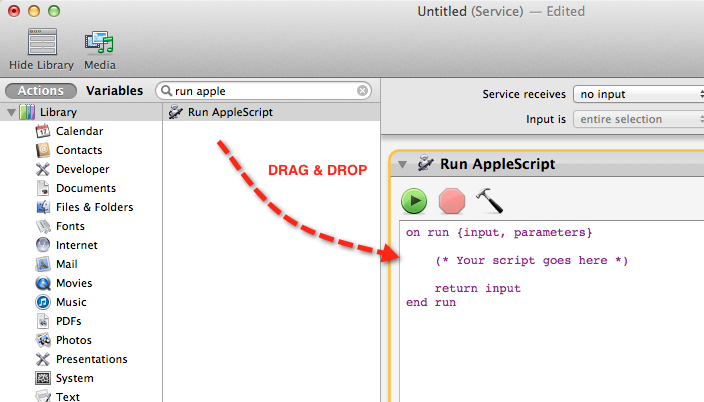 Paste the code into the Automator pane. 7. 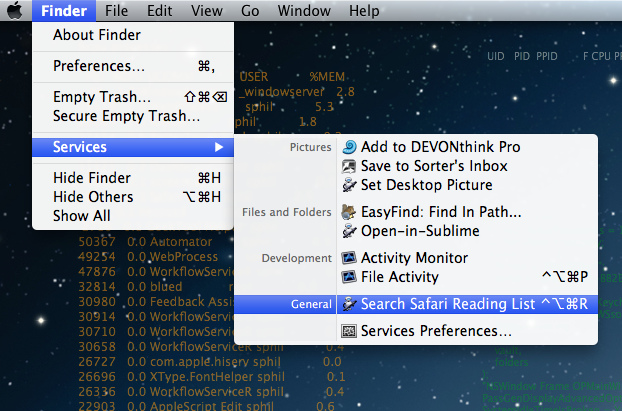 Hit ‘Command-S’ and give it a name like ‘Search Safari Reading List’. Click ‘Save’ (note: you do not specify a location for the save as it will automatically be saved in your ~/Library/Services folder). 8. Now click on the main menu for any app and have a look in the Services submenu. 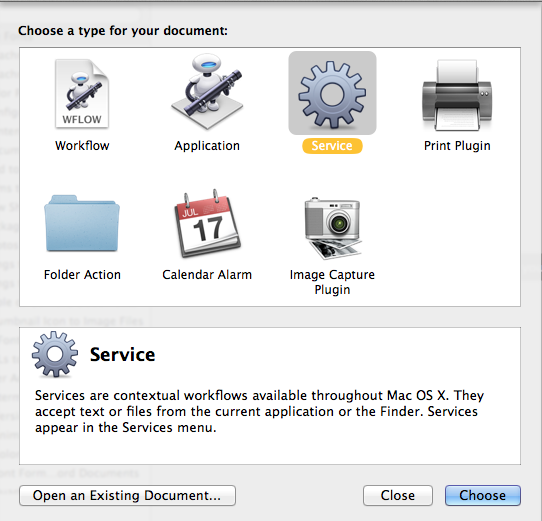 You should see your new service there (to add the keyboard shortcut, see Step 10 below). 10. If you want to assign a universal shortcut key like mine in the screenshot from Step 8, do so by going to  > System Preferences > Keyboard > Keyboard shortcuts. Look in Services for the name you gave it and add the shortcut by clicking in the empty space to the far right of the name. The reading list is really just a list of special bookmarks, with one difference: they contain short snippets or previews from each page. This has an impact on the way my script works in the following way: if the search string is in the preview snippet but isn’t in the URL, you’ll get back the line from the snippet but you won’t get the URL. It might be possible to code round that, but I haven’t had time to figure it out yet. If that’s a feature you want, send me a nag mail and I’ll put it on my list of things to do! ;). Otherwise it appears to function quite well as a workaround for the lack of a proper search facility. If you’re new to Mac, you’re probably thinking that it’s a no-brainer that you need some kind of anti-virus app. Once you start looking around the web for reviews, it’s inevitable that you’re going to come across the Great Mac AntiVirus Debate: in the one corner, those who say Mac users who forego antivirus protection are arrogant and just setting themselves up for a fall, and in the other those who’ve used Macs for umpteen years, never had or heard of any real threat, and consequently say AV software is a waste of time. You can read round this debate for years and never come to a satisfying conclusion, largely because its as much about what you ‘ought’ to do as it is about what is the case. Just because you’ve never had any viruses, doesn’t mean you won’t get one tomorrow. And yet, there are NO viruses in the wild known to affect macs, and so when one does arrive, it will be unknown to your AV scanner. Hence, an AV Scanner is just a waste of system resources (and possibly money, if you paid for it). Yikes! What do I do!! What you do is sidestep the whole debate and stop thinking only about virus scanners, which after all deal with only a small subset of all the possible attack vectors in the internet age, and start thinking in terms of vulnerability scanners. Unlike a simple virus scanner, a vulnerability scanner examines your system not only for malware but also for any vulnerabilities in commercial software, plug ins, your system setup (including network and other sharing settings) and other installed items. The scanner will not only explain the threat and its severity but also tell you what, if anything, you need to do, recommend patches and guide you to links for more info where available. You can use something like Nessus for free if you are a home user, which will give you a far better insight into the possible attacks someone could implement on your system (and it will check your system against almost all of the major virus scanner databases like Symantec, etc). 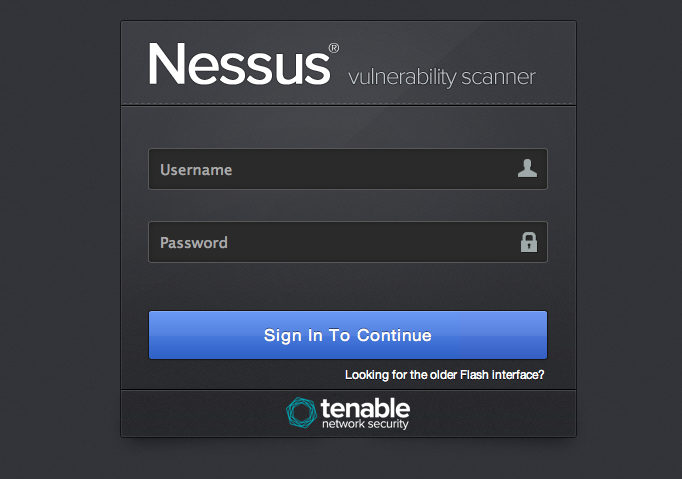 Even better, a vulnerability scanner like Nessus won’t just examine your machine, it’ll look at everything else (and all the installed apps) of anything on your home network including phones (any platform), other computer systems (any OS), and even your router.